With an Aztec name that translates to “Steep Mountain,” the Mombacho volcano certainly lives up to its name. Its 4,410-foot (1,344-meter) peak towers over Nicaragua’s colonial city of Granada, creating both a beautiful backdrop and a huge backyard ripe for adventure and exploration. The summit of Mombacho is reachable by road, but the most rewarding way to explore the volcano is on foot: pass through sprawling coffee plantations, fields of wild orchids, and unspoiled cloud forest dotted with natural hot springs and hissing fumaroles. A number of hiking trails run up to the summit and through the surrounding Mombacho Cloud Forest Reserve, which is home to an impressive 800 plant species and 171 animal and bird species, including quetzals, hummingbirds, howler monkeys, and unique indigenous critters such as the Mombacho butterfly and Mombacho salamander. You can also access the summit on one of four daily truck rides. Most Mombacho hikes require a guide, which you can book in advance or at the entrance to the mombacho Volcano Nature Reserve. Canopy zipline tours are also popular, especially among families, with various routes encompassing lofty platforms and hanging bridges. Mombacho volcano is a must-do for outdoor enthusiasts. Lodges and campsites are available; book ahead. El Cráter is the most kid-friendly and well-marked trail. Take your own truck to the summit only if it is equipped with 4WD and you have experience driving on steep inclines and unpaved roads. Mombacho is located in the Mombacho Volcano Nature Reserve, six miles (10 kilometers) south of Granada. Catch any public bus from the cemetery and ask the driver to drop you off at Mombacho, and then grab a tuk-tuk for the short ride to the entrance. If taking your own vehicle, follow signs for the reserve along the Granada-Nandaime highway. A third but more expensive option is to take a taxi from Granada straight to the entrance. The Mombacho Volcano Nature Reserve is open from 8am to 5pm Friday through Sunday or by reservation. Go early in the morning for minimal crowds and maximum time to hang out; the last truck to the summit goes up at 1pm and comes down at 4pm. If visiting from Managua or Masaya, be sure to leave early to get a head start on traffic. The Mombacho volcano’s last eruption, more than 3,000 years ago, was responsible for creating the many islands of Lake Nicaragua. Today, the now-dormant Mombacho offers spectacular views over the glittering lake and Las Isletas below. 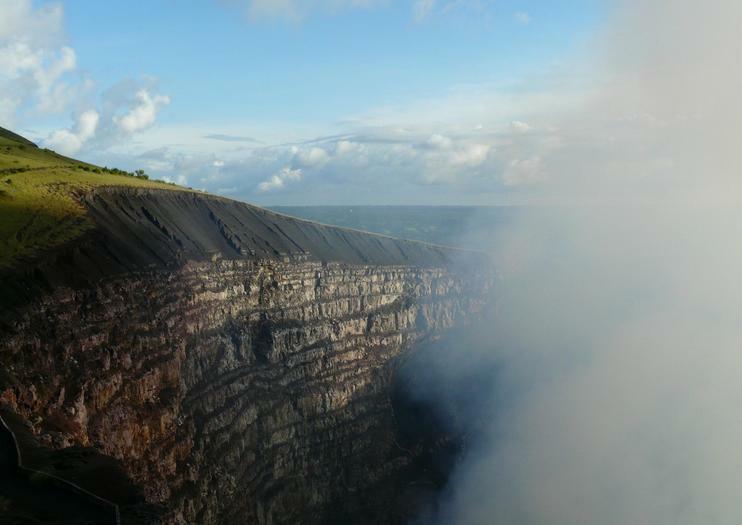 Unleash your inner adventurer on a full-day hiking tour of the Mombacho Volcano from Managua. Alongside your guide, you’ll take a moderate hiking trail — replete with more than 30 species of birds, monkeys and reptiles — to the summit of the Mombacho Volcano. From there, gaze at spectacular views of Granada and Lake Nicaragua before descending to experience the adrenaline of ziplining. On 15 different platforms, you’ll glide over the rainforest and feel exhilarated as you soar over trees rife with wildlife. Conclude your tour by watching the sun set. Relish the secluded serenity of the Isletas de Granada on a full-day trip from San Juan del Sur. On arrival in Granada, you’ll take a brief tour of the city’s vibrant architecture and then climb aboard a boat destined for the Isletas de Granada. Gaze at the dramatic silhouette of the Mombacho Volcano as you cruise on Lake Granada and then stop for a traditional lunch on one of the islands. Sated, opt to swim or canoe between islands before visiting Monkey Island to engage with playful primates. Zoom down a zipline through a cloud forest during this 5-hour tour from Managua. Visit the 4,410-foot (1,344-meter) Mombacho Volcano to participate in this adrenaline-fueled activity. As you whip through the lush forest, view native species that live only in Nicaragua. Follow your adventure guide between the cloud forest's platforms, enjoying a thrilling ride while simultaneously learning about the history, culture and environment of the region. Round-trip transportation from Managua hotels is included. Get a comprehensive overview of Granada from the ground up on this 3-hour walking tour, including a ride on a horse-drawn carriage. Get views of the city from the top of the belltower at Iglesia La Merced, visit the Convent of San Francisco, and stop by La Casa de Los Tres Mundos, an art gallery and cultural academy. All entrance fees and round-trip hotel transportation are included. Surrender to the colonial charm of Granada on a 4-hour bike tour of the vibrant Nicaraguan city. Atop a modern bicycle, you’ll enjoy a panoramic view of sights like Mombacho Volcano and the Church of Guadalupe. Stop intermittently to listen to informative commentary from your guide and discover the tropical flora and fauna of the forest as you take an alternative route to Asese Port. See, too, the Bellas Artes Museum and the ancient canons of the colonial port as you explore. This Mombacho Volcano tour from Granada provides three options for seeing Nicaragua’s most popular volcanic cloud forest. Choose from a short self-guided hike or two longer guided hikes that provide on-the-ground perspective on the natural landscape, and then gear up for a zipline canopy tour with 11 cables, three hanging bridges, and a Tarzan swing. A guided tour is the easiest way to travel from San Juan del Sur to Mombacho Volcano Nature Reserve in one day. When you arrive, hike to a vista point and take a zipline canopy tour through the cloud forest, returning to San Juan in time to catch the sunset over the bay. Learn how coffee gets to your cup during this 2-hour guided tour of Hacienda El Progreso. The farm is located at the base of the looming Mombacho Volcano amid lush vegetation and produces Café Las Flores, one of Nicaragua's finest coffees. Learn about about the growing, harvesting and roasting processes of this Rainforest Alliance coffee farm. Round-trip transportation from Managua is included. Granada —with its rich history and vibrant architecture— has been charming travellers for centuries. On this full-day tour of Granada, you’ll visit the city’s historical highlights and learn about local culture from your guide. See highlights such as San Juan de Dios hospital and Fortaleza La Polvora during a horse-and-carriage ride; explore the city further on a walking tour; and conclude with a relaxing boat ride around Lake Nicaragua. On this small-group tour —limited to 15 people — you’ll receive personalized attention from your guide. Discover and enjoy the architecture, landscapes, and history of the first European city founded in Latin America, Granada. Let its nature amaze you; Mombacho Volcano, Islets of Granada, and Lake Cocibolca await for you. In this tour you will also meet the locals, enjoy national gastronomy, and walk on the colonial streets. This Mombacho Volcano tour lets you explore the the popular wildlife area in three different ways under one easy booking. Ride an ATV up steep slopes, hike with a guide on the ground, and fly across the canopy on a zipline tour. This tour even includes hotel pickup and drop-off for hassle-free transportation to and from the park. Gaze at the magnificent Mompacho Volcano on a half-day tour of Mombacho Natural Reserve from Granada. After a scenic drive up the volcano, you’ll arrive at the biological station near the summit. Choose to embark on a guided hike on trails abundant with flora and fauna or satisfy your appetite for adventure during a zipline experience (own expense). See, too, stunning views of Lake Nicaragua and Las Isletas on a clear day. Round-trip transport from your Granada hotel is included. Costa Rica to Nicaragua multi-day tour, travel with us from La Fortuna (Costa Rica) to Granada (Nicaragua). Discover colonial Granada and its surroundings. First you travel from La Fortuna to Las Tablillas, border crossing with Nicaragua, by air-conditioned transportation. After border formalities you continue by air-conditioned transportation to Granada (Nicaragua). Here you stay two nights and afterwards you return to La Fortuna. Climb 6 volcanoes during this 15-day private trekking tour in Nicaragua. Learn about the history, culture and ecology of Nicaragua and visit several diverse ecosystems. Get a picture of the 'real' Nicaragua through visits to off-the-beaten path locations and encounters with locals. Climb Cosigüina, San Cristobal, Telica, Pilas el Hoyo, Concepción and Mombacho volcanoes. Round-trip transportation, a local guide, nightly accommodations and some meals are included.